Customize and simplify your media player deployment with a dedicated team of experts. The Akamai Adaptive Media Player (AMP) provides a simple way to insert a quality media playback experience in your web, mobile, and connected-TV applications with SDKs for web, iOS, tvOS, Android, and Chromecast. Typically you have to integrate a lot of components for quality video application. AMP pre-instruments various capabilities for Playback, Delivery, Monetization, and Measurement – all from various sources – into one modular package. 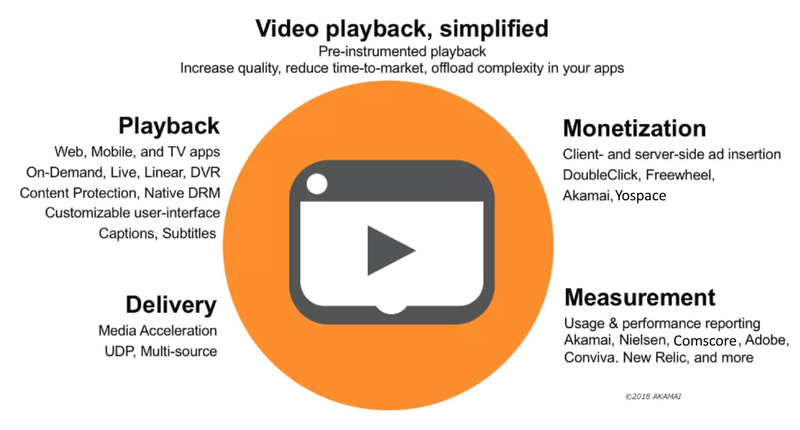 Whether you’re building out your OTT service or offering an enterprise webcasting application, Akamai AMP provides a single SDK that pre-integrates playback, delivery, monetization, and measurement to ensure a fast, reliable, quality deployment. This can greatly reduce your work and give you a faster time to market. Technical Support for AMP is provided by a dedicated, specialized team within Akamai, and they work closely with Akamai Technical Support. For player applications, it’s not always clear where a problem may lie, and AMP support will always help drive to resolution, regardless of the source of the issue. Specialized Professional Services personnel provide implementation assistance for customers, offering high-touch integration help for both simple and complex implementations on all platforms for web, mobile, and TV. Additionally, the AMP team is continually updating the player to adapt to the new customer requirements, changes in technical ecosystem, and evolving industry business requirements. Sign up for the Akamai Developer Program today. Get access to the latest developer tools, exclusive BETAs, upcoming events, and so much more.